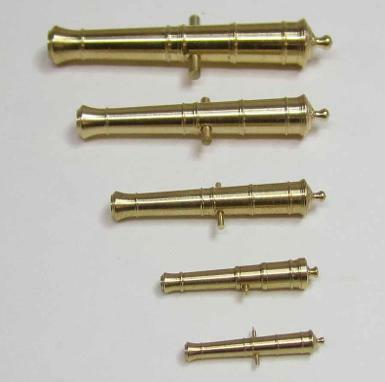 These miniature brass cannon were CNC turned. They were made for the use on 18th and early 19th century ship models. 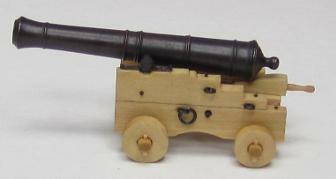 These miniature cannon were cast in black resin and are very detailed including an English monogram and touch hole. To see if these ship model cannon will fit you model...download the attached PDF and check them against what your model requires. The plan can also be used to help you create an accurate gun carriage from the time period. Additional cannon sizes will be made available real soon. Building a carriage for the long guns...a PDF tutorial. Laser cut basswood carriage parts are also available and can be found here. NEW!!! - Black Cast Resin Cannon with English Monogram. (above left has been weathered after removing sprues and spraying with dull coat. Be sure to read the instruction on how to prepare your resin cannon.